UPDATED: Wed., May 17, 2017, 11:10 p.m. 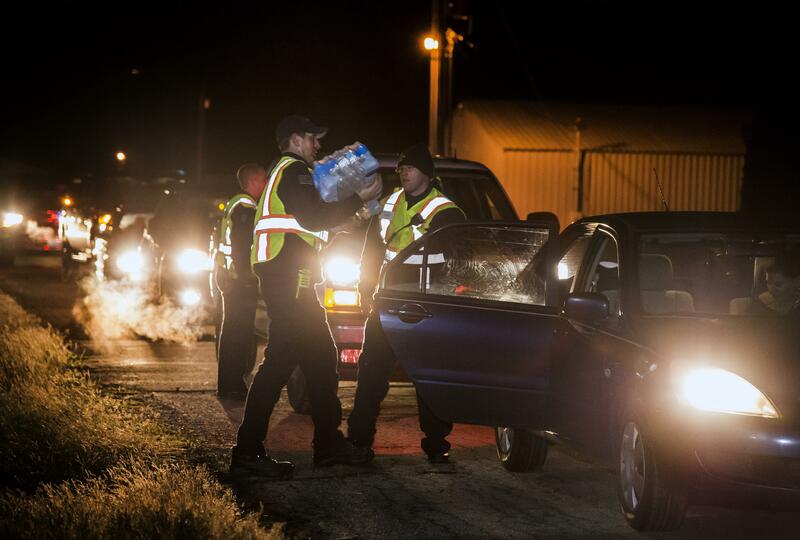 When news broke late last night that water from city pipes likely is contaminated with chemicals used on Fairchild Air Force Base, word quickly spread that city officials were handing out bottled water. Hundreds began arriving behind the grocery store Tuesday night. Firefighters and volunteers handed out more than 300 packs of water by 9:15 p.m. But by about 7 a.m. the next morning, all of the water was gone – about 700 gallons total, said Mitch Metzger, fire chief for Airway Heights. Another shipment of several thousand gallons was due this morning, according to Deputy fire chief Nate Whannell. Grocery stores in Airway Heights, too, were completely out, according to residents who checked, as well as the Wal-Mart. Some stores were receiving shipments as they were selling out, including Yoke’s, which got in more packs of bottled water at about 9:30 a.m.
“We contacted grocery stores last night letting them know this was coming so they could stock up as well,” Metzger said. Sproule said he wasn’t “paranoid” about the water situation, saying that he drank some this morning and used it to make coffee. He said if he didn’t find any bottled water today that he and his family likely would just drink from their tap and not worry too much. But others weren’t so casual. Grall, who finally received two packs of bottled water after two men donated 20 after hearing about the crisis on the news, said she’s worried and grossed out about the thought her water could be contaminated. She said she refused to drink any water from her tap until she knows it’s safe. Until then, she’s sticking strictly to bottled water – and so is her 4-year-old grandson. The perfluorinated chemicals, known by the acronyms PFOS and PFOA, previously were found in a number of private residential wells east of Fairchild. The chemicals are believed to have come from a fire-extinguishing foam the Air Force used from 1970 until last year on a fire-training site as well as two locations where aircraft have crashed. Terri and Richard Link, who live in the Sands Mobile Park near where water was distributed to residents, think their water has been contaminated for much longer than what officials are saying. She and her husband said they plan on suing the base and possibly the city for not disclosing the contaminates to residents. They said for more than five years they’ve both felt sick with flu-like symptoms that never seem to go away. The Village Tavern along West Sunset Highway is the unofficial spot to talk about all things contaminated water. “I think it’s overkill,” said Kevin Herley of the city’s water restrictions, as he took a sip from his canned Budweiser. He talked slow but deliberately, and from what the other regulars at the bar indicated, half of what he says was dripping with sarcasm. “I mean, I’m not sitting on the toilet over there cause the water might be contaminated,” he said straight-faced. Jean Moore, who co-owns the tavern with her business partner Tracy Moore, also thinks people are making too much of a fuss. Though she can’t sell things like soda or tea, or use ice in mixed drinks if it isn’t carbon filtered, the regulars haven’t complained, since the alcohol is clean, she said. She does have a friend, though, who has felt the impact. She apparently just put her house on the market five days ago and had two offers before news broke last night. “They both backed out,” she said. Other business owners aren’t as lucky as Moore. Kristen Otoupalik, who co-owns the On Alert Caffeine Station espresso stand with her husband, was open for most of the day Wednesday before getting a call from the state Department of Health, notifying her she could no longer use the water, which she was carbon filtering. On Alert was “swamped,” Otoupalik said, before she was forced to shut down for the day at about 3 p.m.
“We’ll be open tomorrow,” she said assuredly. Other restaurants along Sunset Highway also were closed, including Rosa’s Pizza and Wolfy’s Hamburgers – or, anything that used a lot of water in their cooking, according to one worker at Zip’s Drive-In who was not cleared to talk to media. At Northern Quest Casino, the water advisory forced restaurant employees to wash and cook food with bottled water, and temporarily take a number of items off of their menus. The casino also printed hundreds of pamphlets to notify customers about the water situation, said communication director Julie Holland. Holland said the water advisory has been a major inconvenience for customers and staff. But she declined to say if the Kalispel Tribe of Indians, which owns and operates the casino, would seek reimbursement from the agencies responsible for the contamination. Hearing of the possible contamination last night, school officials at Sunset Elementary School blocked off water fountains and bought hundreds of packs of water at local grocery stores. “There are signs posted on all the doors, all of the teachers know, and letters will be sent out to the parents, if they don’t already know,” said Jeff McClure, director of maintenance operations and safety at Cheney School District. The bottled water mostly was used for cooking school lunches, while Culligan water dispensers were set up near water fountains with clear instructions for students, McClure said. Staff writer Chad Sokol contributed to this report. Published: May 17, 2017, 10:46 a.m. Updated: May 17, 2017, 11:10 p.m.